Ospringe is situated on the southern edge of Faversham. The conservation at Ospringe was designated in 1982. It is centred on Ospringe Street and Water Lane It consists of linear development running east-west along Ospringe Street, and a line of more informally structured development running north-south along Water Lane on the line of a shallow chalk valley. 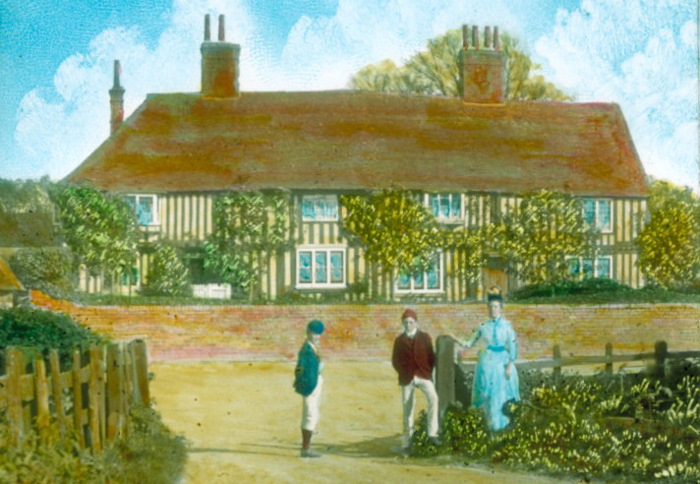 The outward spread of development from Faversham has now caused Ospringe to become joined to its larger neighbour but its very separate historical development means that the smaller settlement still retains its own strongly distinctive character. In Roman times a posting station (Durolevum) was situated a short distance to the west of present day Ospringe, close to Judd Hill on Watling Street. 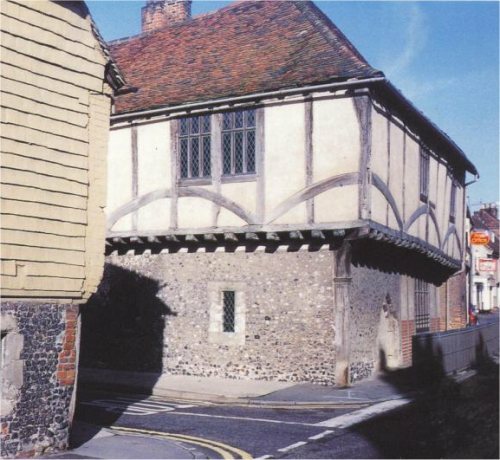 In medieval times the road through Ospringe was again of great strategic importance as the connection between London and Canterbury; and after 1170 it was much used by pilgrims journeying to the Shrine of St Thomas a Becket. In 1234 King Henry III founded a hospital at Ospringe to care for the sick, the aged, travellers and pilgrims. Known from its earliest days as Maison Dieu, the 13th century remnants of hospital buildings (perhaps housing the chantry priests) still survive on either side of Water Lane. In past times a nailbourne ran north along the Ospringe valley with water flowing north along the Water Lane carriageway from the corner of Mutton Lane. By the end of the 20th century, however, the stream had dried up and the old red brick bridge in Vicarage Lane over the dry stream bed is now a ghostly reminder of the once picturesque watercourse. Development along Ospringe Street today consists largely of 18th century and 19th century brick-built town houses and cottages, although in amongst them are a number of older survivals (including the Maison Dieu and a number of other timber framed buildings) which record the earlier origins of the place. These traditional buildings are arranged rather tightly along the snaking linear form of the main road; in the view from the hill to the east the jumbled peg-tiled roofs, brick chimney stacks and clay chimney pots are a defining feature of the place. Also prominent in this view is the undeviating Roman alignment of the road as it climbs up towards Judd Hill and its sweep of parkland trees. Until recently there was a good scattering of shops and public houses along Ospringe Street. Today however, the place is almost entirely residential in character, and the only public house to remain trading is the 18th century Ship Inn; it's small bar fronts, vertical tile hanging and colourful clay tiled roof are characteristically Kentish in appearance. 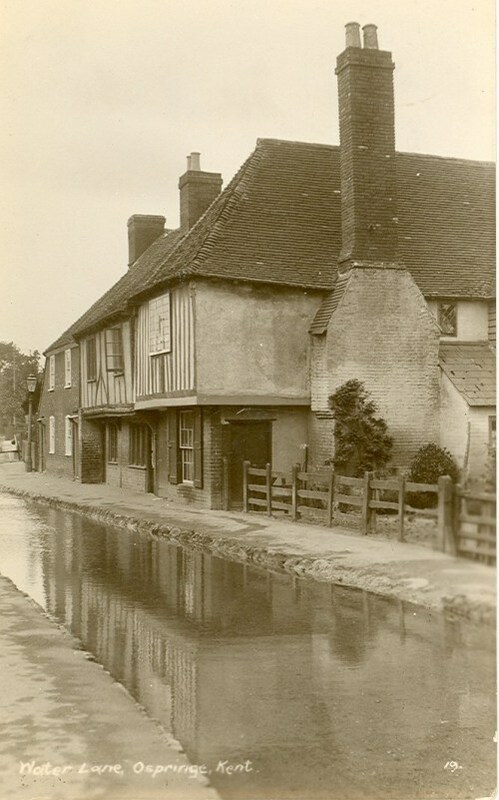 Its continuing use as a public house is an important reminder that Ospringe Street was once a place of inns and overnight stops for travellers journeying to and from London (and beyond); its presence might therefore be described as a crucial part of the historical character of the Ospringe environment. The last surviving shop in Ospringe Street, a traditional butcher's business, closed in 2010. Development along Water Lane is, by contrast, more informally structured and towards the southern end of the lane it becomes quite scattered so the countryside becomes an important part of the street scene. The western side of the lane is marked by scattered groups of cottages, although the intervening gaps have now been infilled with later development. These cottages mostly date from the 19th century, but there are some older timber-framed houses in amongst them, and also the yellow brick village school built in 1851. To the south of Mutton Lane fields break through into the road frontage. Queen Court (once the property of successive Queens of England) is a large working farm complex with modern buildings now set alongside the 15th century wealden farmhouse; two large timber-framed barns also survive. Just beyond is the flint and ragstone Ospringe church and the timber-framed (former) vicarage; these two buildings round off the southern end of the settlement. Water Lane embraces a change from urban to rural character; this transition is a defining feature of the lane and the entwining of the countryside with development towards its southern end is especially striking. Mutton Lane and Vicarage Lane, both narrow and rural in character, strike off Water Lane to the east and climb the slope on the eastern side of the nailbourne valley where woodland edges help to define the limits of the valley.